If you've ever been lured by an incredible scent on a walk, chances are you might have passed a viburnum shrub. It's one of the most intense fragrances I've ever encountered. 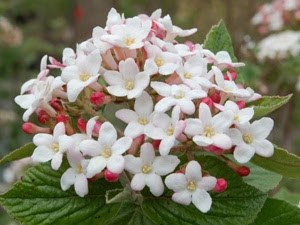 "Tough as nails with a heavenly fragrance, the Viburnum burkwoodii Mohawk is an outstanding choice for a hedge shrub. "It has beautiful flowers and fragrance in the spring, pretty summer berries for the song birds, and beautiful orange leaves for fall." Check out this wonderful plant at Great Garden Plants.